Serbia has long been a place of importance on the trade route between Europe and Asia, and because of its significance, has had an unsettled past. Like much of Europe, Serbia was settled in the 3rd century BC by the Celts, but was later conquered by the Romans and became part of their military frontier. 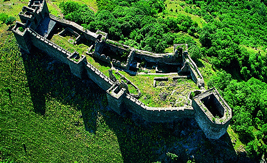 Belgrade's Kalemegdan Fortress gives us an insight into Serbia's story. A Celtic tribe called the Scordisci first started building defences where the Danube and the Sava rivers meet. After the Romans took over the Fortress, it became a part of their military frontier between east and west. The name Kalemegdan is very fitting as it derives from the Arabic and Turkish languages and signifies the 'Fortress amidst battlefields'. Today it is a majour tourist attraction. 11th Century - The first Serb Princes were recorded . Over the next three centuries medieval Serbia flourished as new trade routes opened up. 15th Century - Serbia fell under the rule of the Ottoman Empire. assassination of Heir-Apparent to the Austrian throne, Archduke Franz Ferdinand was used as a pretext for Austria to invade Serbia and this marked the beginning of the First World War. At the end of the First World War, Montenegro voted for union with the Serb and along with other Slav regions formed a key part of the new State of Slovenes, Croats and Serbs which became Yugoslavia in 1929. After organising a spirited opposition to German occupation in the Second World War, Serbia became a Socialist Republic and the country was transformed from an agricultural to an industrial society. The various Yugoslav states broke down in 1991/2 and Serbia became Serbia Montenegro. 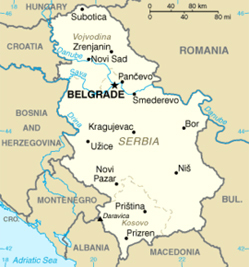 The year 2006 saw Serbia and Montenegro separating and becoming separate nation states. Its hard to say which dish can be called typical Serbian. Serbian national cuisine is a basicaly a mixture of various meals from surrounding countries, only Serbs add more meat to it, and call it their own. 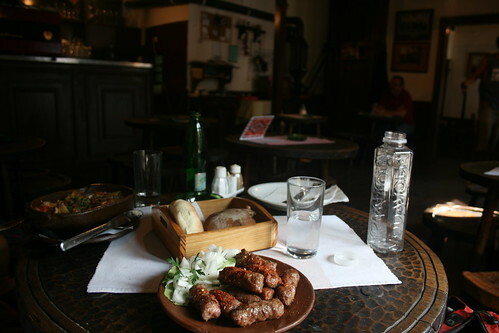 Here are some typical Serbian specialties that can come before you in a plate when you go to a national restaurant in Belgrade. Jagnjeca crevca u saftu it’s best that this one remains without the explanation. Be brave and order it. Papci na kuma this one is a surprise. Šumadijska tepsija this one too. Duvan cvarci, or simply cvarci /chvartzi/ chips made out of pig. Sounds silly, doesnt it? In most bakeries they make Burek not a typical Serbian dish (more Bosnian, Albanian, Macedonian or Turkish) but you can find great burek in Belgrade too.